Places are limited and our facility is very popular. Guests with no advance table reservation may be turned away. Thank you for your understanding. Karijini Eco Retreat is an environmentally friendly accommodation and restaurant facility nestled in the pristine bushland at Joffre Gorge - in the heart of the world-class Karijini National Park. Alongside the outback bush camping experience, the multi-award-winning Karijini Eco Retreat is the first and only facility to offer comfortable glamping accommodation in the Park! Offering quality accommodation and facilities, the management and staff look forward to welcoming you to a unique world of environmentally friendly, affordable accommodation and camping options with a touch of outback luxury and a taste of genuine mateship and hospitality in outback Western Australia! Designed with the environment in mind - guests at the Karijini Eco Retreat embrace a 'greener' style of accommodation. The semi-permanent deluxe eco tents, cabins, campground and facilities incorporate eco-friendly practices which ensure environmentally sustainable management of the natural and cultural values of one of the most ancient landscapes on earth. Choose from a range of accommodation including 64 campsites, 5 group campsites, 40 upmarket eco tents with ensuites, 10 'Dorm Style' eco tents, 8 'Dorm Style' cabins, and a delightful outback style alfresco licensed Restaurant offering quality meals with a traditional Australian flavour! Our outback restaurant menu is uniquely Australian with tempting delights guaranteed to please! Continental and cooked breakfasts are offered each morning. Packed picnic lunches and snacks are prepared daily to take to the gorges with you. Coffee, tea, snacks and drinks are also available all day at the kiosk/gift shop. Karijini Eco Retreat is owned by Gumala Enterprises Pty Ltd (GEPL) which exists to return benefits to the Gumala Aboriginal Corporation representing the collective interests of the Nyiyaparlii, Banyjima and Innawonga Aboriginal people of the Pilbara region. Visit www.gumala.com.au for further information. 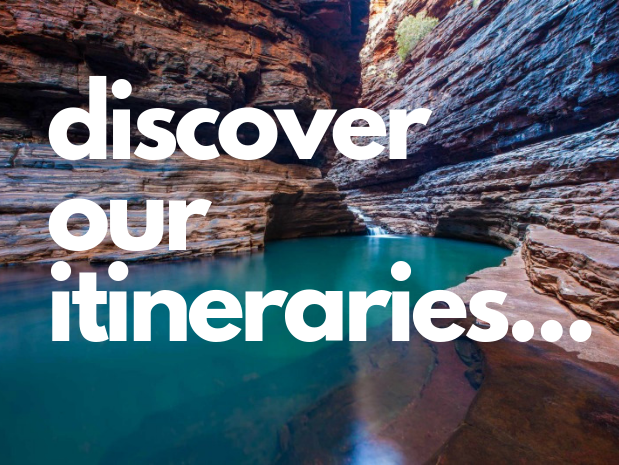 Please note that entry fees apply to many WA national parks including Karijini National Park. Passes are available for purchase at entry points to the park, Department of Parks and Wildlife, or Karijini Eco Retreat itself. Our team look forward to welcoming you to the Karijini Eco Retreat! Any questions? Just click here to see our FAQ's.